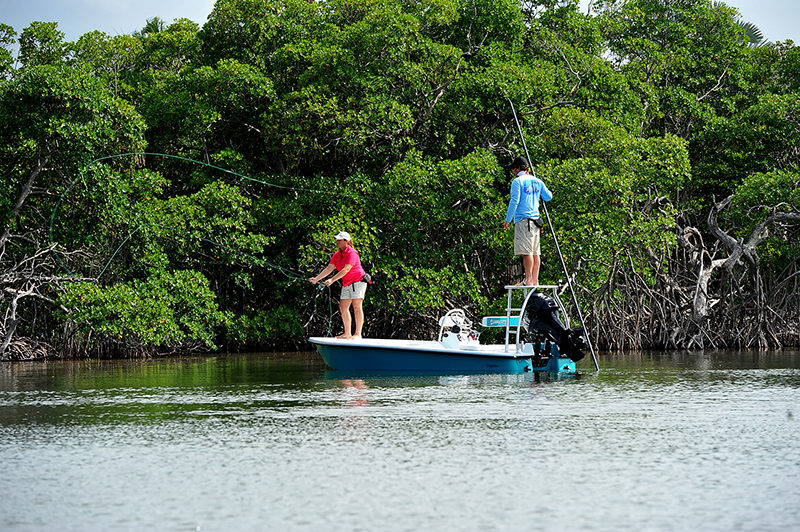 Custom-built in Ft. Pierce, Florida, Ankona technical poling skiffs and flats boats offer world-class performance and world-class value. Designed for longer runs across open waters, the 16'11" Cayenne incorporates more 'V' forward and more freeboard than the Copperhead while still maintaining Ankona's trademark poling characteristics and an honest 6" poling draft. Tunnel-hull skiffs aren't generally known for their ride and poling performance. But we designed, prototyped, tested, and re-worked the Cayenne time and again until we were satisfied it could compete with any other tech skiff on the market. At the same time, the Cayenne's zero-degree bottom at the stern and carefully optimized tunnel allow it to get on plane — and stay there — in exceptionally shallow water. The Cayenne tops out around 37 mph with remote steering and a 60 hp, 32 mph with a tiller 40 hp. The Cayenne features wide, walkaround gunnels; a large, uncluttered forward deck; and a molded inner liner. It is available with a tiller console, a center console, or an offset console. A single large dry locker under the aft dock is accessed via gas-assisted hatch on the Backcountry edition. On the Tournament edition, twin stern hatches access a pair of 20-gallon compartments, with the port compartment ready for livewell plumbing. Forward storage is accessed via a large bulkhead hatch on both editions. Capacity: 4 persons / 585 lbs. Thanks for you interest in Ankona! We'll be in touch soon.